After Newt Gingrich handily defeated Mitt Romney this weekend in the GOP primary in South Carolina, he has decided to release his much-talked-about 2010 and 2011 tax returns. Bowing to the pressure, Romney made the announcement in an interview on Fox News Sunday: "I was planning on releasing them in April, when they have been released by other candidates in the past," Romney said to the show's host, Chris Wallace. "But given all the attention that has been focused on tax returns, given the distraction that I think they became in these last couple weeks … I will release my tax returns for 2010 … on Tuesday this week. 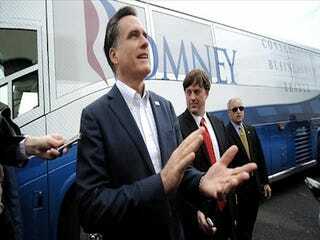 "I will also release at the same time an estimate for 2011 tax returns," Romney added. "So you will have two years; people will have a good look at it. We will put it on the website. And you can go through the pages. I think we just made a mistake in holding off as long as we did. It was a distraction. We want to get back to the real issues in the campaign." Newt Gingrich applauded the move and tweeted, "I think that's a very good thing he is doing, and I commend him for it," he said, according to a tweet from the show's executive producer, Betsy Fischer. Between the Bain Capital stories and the publicity over his tax returns, Romney's finances have certainly become a diversion. But does anyone not know that he is a rich, Northeast Republican? The truth is, in the end what matters most is who has the most money to produce attack ads and keep his face in the public eye — and that will be Romney. That's why he's the favorite to win the GOP nomination.